I don’t eat fish (except whiting), weird, I know. So I have to get my omega 3’s from somewhere. Thank goodness for Golden Flax Flakes, little golden flakes of deliciousness packed with omega 3’s. Sometimes in the morning or afternoon (like most people) I feel like a bite sized bit of sweetness, and this is where bliss balls tend to make their grand entrance (I conjure them up on demand). 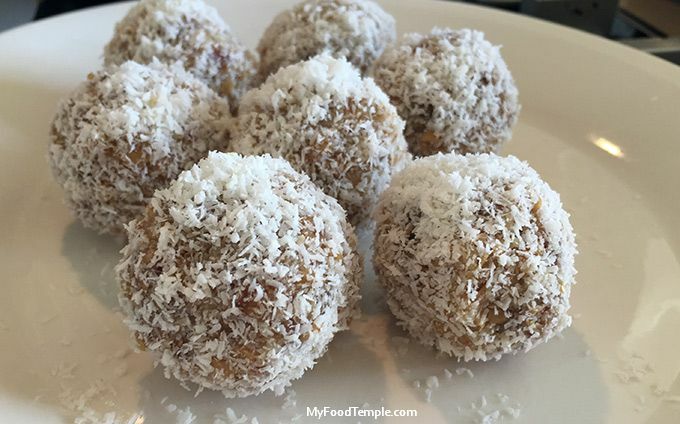 These golden flax and coconut bliss balls have just enough sweetness to keep cravings satisfied and my omega 3’s topped up. Using a good quality virgin coconut oil can make a difference. I used Planet Food unrefined virgin coconut oil which is solid at room temperature. This was the first time I’d used this particular brand, so I had to taste it first of course (as you do) and it is exceptional. I was tempted to just eat it out of the jar by the teaspoon as is – but I quickly told myself off and stuck to an additional half a teaspoon. Some tastings need to be done twice, just to double check the first impression was spot on…..you know what I mean, and it was.